Asian demand for ‘clean food’ amid rising pollution, food scandals and increasing discomfort around the use of pesticides, is driving the region’s indoor agriculture sector, according to a new whitepaper from Newbean Capital, the investment advisory firm. ‘The Rise of Asia’s Indoor Agriculture Industry’ has been released to mark the first day of Newbean Capital’s Singapore conference, Indoor Ag-Con Asia. From melamine in baby food to tainted meat served at fast food restaurant KFC, Chinese consumers are looking for more information about the source of their food. And concerns about radiation exposure in Japan following the Tōhoku earthquake, tsunami and nuclear disaster in 2011 have encouraged consumers to think again about where their food comes from. While the indoor agriculture industry is already a far more established in Asia than anywhere else globally, this demand for clean food — “pesticide free and from reputable sources” — means there’s plenty more room for the industry to grow in the region, according to the whitepaper. Asia’s growing food e-commerce sector also supports indoor agriculture with nearly half of Chinese consumers and more than a third of Asia-Pacific consumers using online groceries, according to market research firm Nielsen. “These changes benefit indoor agriculture, which is able to supplement traditional agriculture by offering a consistent year-round supply of fresh locally grown vegetables, a key factor for increasingly popular organic vegetables and in off seasons when vegetables are hard to source. For instance, Taiwan’s farmers grow around 130 different types of vegetables, but the country still imports 70% of its organic food and beverage,” reads the report. Supportive government policies are another unique driving factor for Asia’s indoor agriculture sector, from subsidies to national policy initiatives. In Japan, more than half of plant factories received either a loan (20%) or a subsidy and a loan (35%) to establish operations. The report also examples initiatives in China, Taiwan and South Korea. So how does Newbean Capital define indoor agriculture in this report? “Growing vegetables in controlled environments, such as warehouses, containers and purpose-built growing chambers, using hydroponic systems.” These indoor farms range from hydroponic greenhouse and plant factories to container farms and in-home systems. 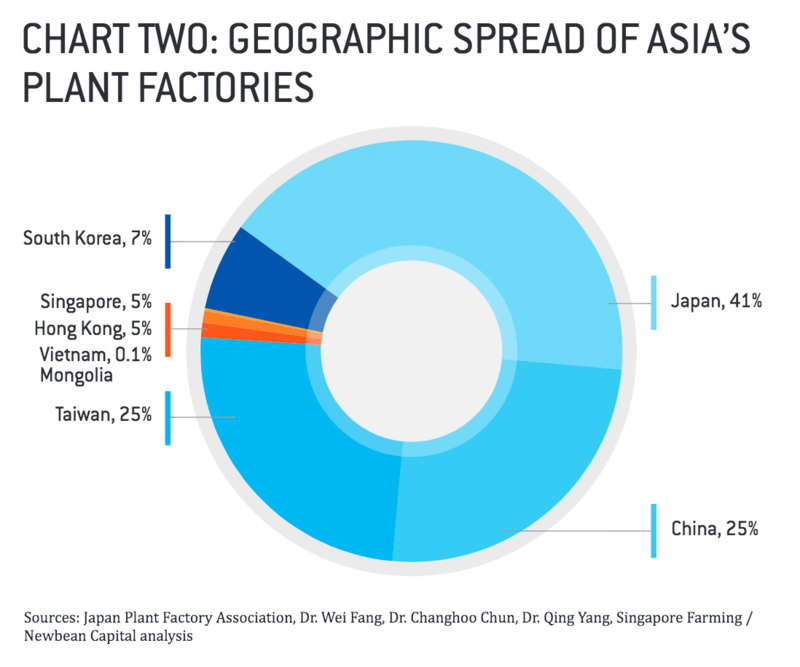 Plant factories are by the far largest segment within indoor agriculture in Asia and Newbean Capital has identified 450 across the region with estimates that this number will climb to 518 by the end of 2016. Japan has the largest number with 40 percent of the market, followed by China (see chart). So what about the technology and where are the opportunities for improvement? The whitepaper lays out six main technologies found in a plant factory: growing systems, environmental control units, nutrient supply and control, air conditioning, carbon dioxide supply units, and lighting. Nutrient supply and control – there’s demand for a better understanding of the soil’s microbiome and impact of nutrients. Air conditioning: growers want cheaper and more efficient air conditioning units that integrate well with other farm controls. Co2 supply units – “Though not the area of greatest promise among those listed here, cheaper methods of supplying and controlling carbon dioxide in plant factories are always welcome, as is a better understanding of the interrelationship between crop yield and Co2 levels. Lighting – as such a vital component of plant factories, there is a world of opportunity to improve and refine lighting and lighting designs for indoor agriculture with growing understanding of how lighting and plant biology interact. Some Lighting “recipes” are often part of an indoor farming company’s intellectual property. Bringing down the costs and energy consumption associated with lighting is a clear theme. Technological development along these lines is one of the key developments that will take place in indoor agriculture in the coming months and years, according to the whitepaper. International expansion, and better economics are other areas that Newbean Capital has highlighted in its ‘What Comes Next’ section. For more facts and figures and in-depth insight, read the report here. Does the Ritz-Carlton’s New Indoor Farm Mean that Indoor Ag is Here to Stay? What do Indoor Farming CEOs Think of Hydroponics Organic Approval?